The 2012 Stratford season isn’t very good. 80% of the reason I say that is Much Ado About Nothing. There are places to improve Henry V, Charlie Brown, The Matchmaker and so much else, but they are all average-good and combined with at least one truly great mainstage could have made for a decent, if-not-memorable, season. Shakespearean comedy has been a reliable fallback for the festival in recent years (even if they didn’t need it to fall back on). The truly great 2009 season had the best Midsummer I’d ever seen, and it was far from the flagship (up against Cyrano and Macbeth); 2010 brought the fascinating surreal As You Like It AND the excellently intimate Two Gentlemen of Verona when The Tempest was already a sure-fire hit. 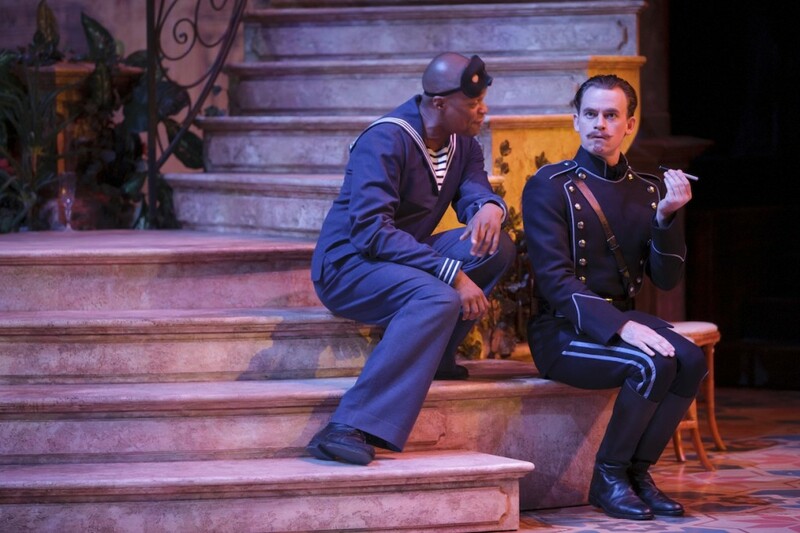 Last year The Merry Wives of Windsor was a disappointment but Twelfth Night easily made up for it and held its own as the biggest non-JCS show of the year. Stratford has been able to rest easy in recent years, knowing that even if audiences weren’t up for the heady tragedies, their mainstage comedies were just as good. Not this year. Almost everything about director Christopher Newton’s Much Ado is underwhelming. He starts with blah principal casting. I appreciate the attempt to give older actors fun parts but Ben Carlson and his wife Deborah Hay are just too old to play Benedick and Beatrice. Their bickering seems immature instead of amusing, their lack of self-awareness is off-putting, and their single-ness is sad (those things being far more charming in youth than middle-age). Hay especially- partly because of age, partly because she’s too kooky to function, partly because of the crimes committed against her by generally good costume designer Santo Loquasto- seems like an old maid, more shrewish Kate than pleasantly independent Beatrice. 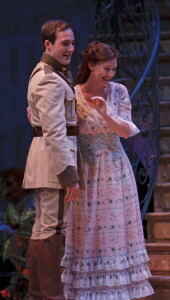 With young Hero and Claudio (Bethany Jillard and Tyrone Savage, probably in their auditions for Romeo & Juliet 2013) nipping at their heels, Canadian theatre power couple Ben & Deb fail to sparkle even when given Shakespeare’s sparkliest banter. Jillard and Savage sparkle a little (but not as much as she usually does) as the happy (then tragic, then happy again) couple. Savage’s outburst at wedding #1 doesn’t feel particularly honest, but if you watch them flirting in the background of 1.1 while Ben & Deb talk nonsense downstage then you’ll care about Hero & Claudio already by the time they actually speak. I was more than looking forward to Gareth Potter’s turn at a villain’s villain with Don John (one of two pieces of my dream cast that came true, along with Jillard as Hero). Famous for changing his performance slightly every show, the Potter I saw seemed caught between having hammy fun and making an honest run at the humanization of the simplistic character. My hyper-critical friend Shruti loved him in all-out-ham form on opening night, so my guess is that Potter’s playing around with who Don John is a little bit at every performance. Who knows, by closing night he might be the hero. Potter’s most interesting moment the night I saw him was when he’s first introduced, he has an odd line about being “not of many words” which Potter delivered on a stern look from his noble brother, as though he’s being silenced- one of the more interesting motivating factors I’ve seen given to Don John. Oddly, though, the potential of that moment isn’t carried through in any sort of darkness within his brother, Don Pedro. 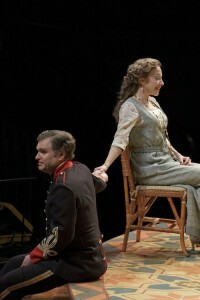 Juan Chioran plays the prince as a lonely good guy, revealing honest rejection when Beatrice mocks his impromptu proposal and lingering sadness when he’s left alone at the end of the play. The choice is a nice one, making Don Pedro more relatable than he often is (and lending interesting resonance to the moment when Don John convinces Claudio that Don Pedro wants to marry Hero himself) but it does the other characters (particularly Don John) little good like a darker interpretation might have. To the character of Dogberry, Richard Binsley brings nothing more than wacky repetition, though his chorus of dimwit watchmen have their moments of amusement. To the character of Leonato, James Blendick brings nothing more than his TV-announcer voice that has a knack for putting an audience to sleep. The only performance that was a pleasant surprise for me was Michael Blake as Borachio. 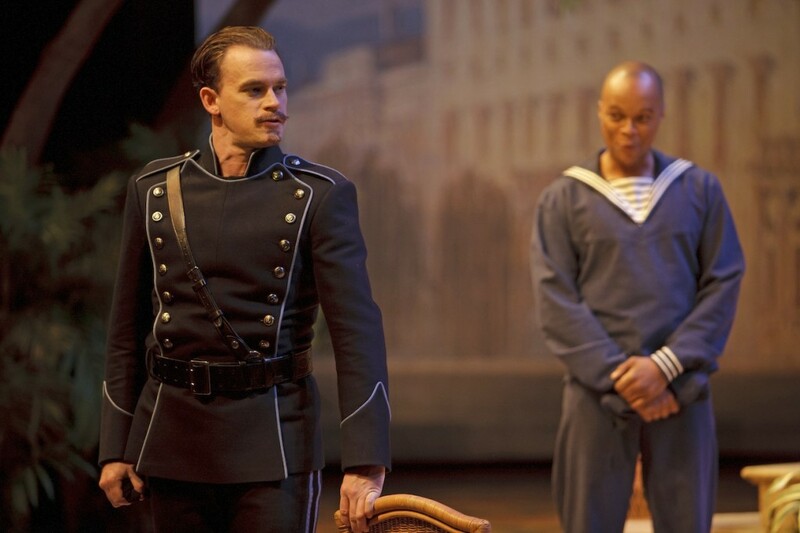 There are no circumstances in which Borachio should be the standout character in Much Ado About Nothing (he has maybe 15 lines), but Blake’s is the Only performance in the entire production that deserves to be part of a better show. Some actors (like Jillard, Potter, and even Carlson or Chioran at points) manage to not actively contribute to the play’s bad-ness, but only Michael Blake actually elevates it. In the early acts, Blake’s Borachio has lots of malicious fun, but it’s when he’s told that the scheme he dreamed up (and played out) to disgrace Hero has caused her death that Blake pulls out the best performance I’ve ever seen from him. A thousands emotion cross his face but it’s a complicated remorse-guilt mix that wins out as Borachio stands upstage listening to Hero’s (fabricated) fate. Later, when he recounts his part in the whole mess, he does so without the glib self-satisfaction of most Borachios. Blake (my latest dream casting for the title role in 2013’s Othello) is the only thing about Stratford’s Much Ado that’s particularly worth seeing (apart from Loquasto’s pretty staircase set and a Fantastic silent subplot centered around the adorable Luke Humphrey as a ladies-man footman who dances, kisses, moves sets and makes trouble). That’s it, a character so minor that he barely speaks and set transitions populated by characters who actually don’t speak- those are the highlights. I’m sure you’ve seen this joke coming from my first sentence but this production really is much ado about not much more than nothing.